I asked her how to be a natural mother. Or she asked me. It was blowing up a storm and we all knew a south wind brings rain. At least in that area. You couldn’t drink the lake water. boiling would have worked. But it was all after the fact. No one succeeded at farming and every story was terrible. but I didn’t know how or when to be the mother. for earth though most girls wanted saddle shoes. I am a rigid angry thing trying to be a mother. I am a wild shaking thing trying to be a mother. Don’t you know a mother can be a thing of arrogance and narrow mind? I was leaning on my elbows and staring off. They said the mother went back into the house-on-fire. They said the father went too. They said the parents didn’t know the baby was already out and safe. It grew up as best it could. Previously published in Could Be (Brick Books, 2009). 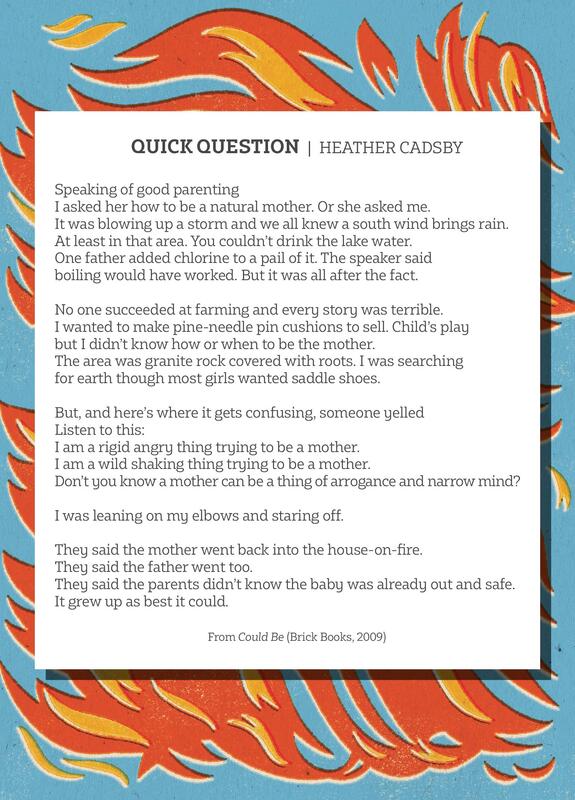 Heather Cadsby is the author of five books of poetry. Her most recent book is Standing in the Flock of Connections (Brick Books, 2018).